No drawings or paintings on this post. This is a post to relieve my frustrations and efforts of days (one whole night too) trying to get my stupid motherboard to work with 24gb of RAM installed (as an upgrade from the 12 I had previously). It's for anyone who has the same problem and hopefully may help, if all else fails. In case anyone dare says query why would I need 24gb of RAM... well I want to use Vue 10 infinite and it chews through the memory something chronic. It kept coming up with a message saying something like 'running low on resources - increase memory' and crawling along slower than an elderly snail. Eeep! So the dratted thing reboots 3 times with the same message and on the fourth boot goes to Windows. But I know what this means. I had a similar prob before, so I look at the system properties and sure enough, 24gb of RAM installed, but only 8gb usable on my Windows 7 Ultimate 64bit rig. I reboot with the same result. URRRGGGHHH. I googled for all I was worth, I fiddled with the bios, I flashed the bios, I reset the CMOS, I changed the voltage to every suggestion on every help techy site under the sun. I spent one whole night pulling the PC (self build, so at least I knew what went where) to bits, I took off the heat sink, cleaned the paste of the cpu, check the cpu for bend pins (there were none I could detect), reset it, put on more thermal paste (luckily had some spare) put back the heatsink, loosen the heatsink so it was held on by a whisker (advice on one site), swore a lot as my heatsink is a tricky beast requiring three hands to hold it and screw on. Sweated a lot. Swapped around and pushed in and out the memory modules in every combination soo many times my fingers would have bled if I hadn't used the back of an old aunts christmas card to protect my fingies - why is everything inside a PC sooo sharp?!?!?! Anyway - nothing worked. I could get 12gbs to run in slots 1,3,5 or 2,4,5 and I could get 16gbs if I added a module in 1,3,5,6 or 1,2,3,6 sometimes, but as soon as I added another module anywhere I'd get the error. I was ready to drop kick the mobo out the window. I'd already started looking online for a new board, but the x58 chipset is becoming redundant and there isn't much to choose from in the UK with a decent spec. I have the i7 x980 which is still a very good chip, and I can't fork out for an equivalent new one - plus there isn't anything wrong with it. So, a last ditch round of googling... and I came across this comment from jfoxedge "...I just happened to search for my processor, and found a page on Intel's site that said it only supports 800 and 1066 memory. Manually set my memory to 1066, no more problem. Never displays the "recovering lost DRAM size" message again.......it must have something to do with the 4GB DIMMs and the i7 CPU's". Under MB Intelligent Tweaker(M.I.T), Advanced Memory Settings, change the System Memory Multiplier (SPD) from Auto (which gave my board a setting of 1333mhz) to 8, which equates to 1066mhz. So I save and exit (PC has a bit of a start - fans whir too fast - and the settings don't 'take' so I do it again and it takes the setting this time). I'd given up on finger crossing by this stage and was waiting for doom to strike. And it loads, no error message, to Windows. I check the system memory and it showed 24gbs installed and usable. I've had this false dawn hope before on first boots, so I reboot, and the same thing all ram shows and is usable. I reboot about 6 times. All is miraculously good!! And the moral to my story, dear friends (to cut a long one short, which I should have done in the first place perhaps), is if you are using 4gb modules with an Intel i7 chip and your dratted motherboard is showing you the Detecting DRAM Size error message, rebooting 4 times and not working with all your installed RAM, try changing the memory mhz in the bios to 1066mhz. After having this fix work perfectly for nearly a year, all of a sudden I had the same DRAM error back again. 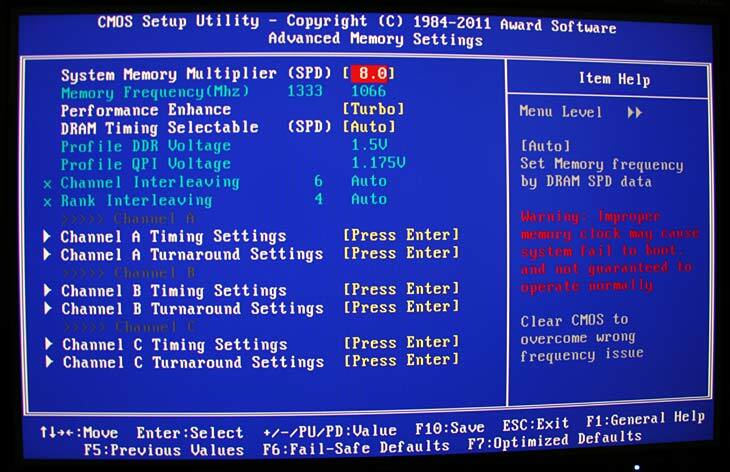 I went into the bios (getting an initial error message about Overclocking changes that maybe affecting the system) and checked the setting I had made, which hadn't changed at all. However I had added a new piece of hardware the day before (a second ssd in my case), which had booted with perfectly the first day, and I had gone into the bios just to check it was showing up ok, tho I exited without changing or saving anything. I thought, however, that this may have done something to the bios even though everything looked ok (plus all the physical cables etc were fine and the actual RAM hadn't been touched). So I went back into the bios, changed the (above instructions) 8 back to Auto (I also changed Performance Enhance to Standard) and Saved and Exited. 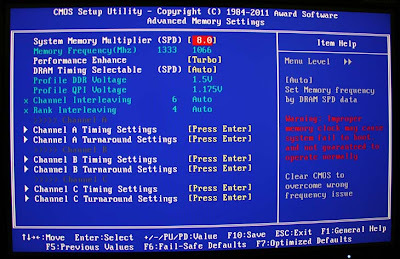 On reboot I went back into the bios and re-put the setting back to 8.0, as per the original fix instructions (changing Standard back to Turbo) and Saved and Exited again. On reboot there was no error. I've rebooted again 3-4 times and still no error. So if you have this problem reoccurring, just do the above as it could just be a glitch in the bios. I was hoping this would work for me too - I have tried everything. I have cleaned and reseated the CPU, updated bios, checked the RAM, replaced the RAM, and limited the RAM like in your computer set up but still no dice. It shows 4 GB of RAM missing, Channels 5 and 6 are not enabled. Bad design on Gigabyte's part. Hey! Thank you so much - your post saved my a number of hours and maybe a ton of time. Most importantly, it saved me a lot of frustration. I had the same problem with a Gigabyte G1 motherboard. Your solution worked like a charm! Sorry you had to go through the same thing, but I really appreciated you taking the time to put the post online. Happy to save your frustration Arjun. I know how tiresome it can be working through all sorts of fixes till you find the one that works (if you're lucky enough to find one that works that is). Every now and then I find I still get the same error message back - not having changed a thing at all. As I put in my edit, going back into the bios, changing it to Auto, then saving, then going back into the bios and putting in 8 again sorts it out. Stupid bug really. All the best! I want to share my story about the same problem above. After i followed the idea, i still face the same problems. So, i try to take out my ddram one by one. And after i finished this try and error, i found that one of my ddram is ERROR. Only one of my 3 ddram is Error. So, after i take that 1 pc that error, my pc running well. That's all. I hope it works for all. I have the exact same configuration and hardware as you have, only that I have the Gigabyte first version of this MoBo, there has been a second one. The problem did occur in August this year at the same time that Microsoft had an issue with an update for W7-64 (KB2982791). So I thought this was the cause, having blue screens. It dissolved automatically after resolving this update problem. Now, today it occurred again, not having changed any hardware etc. So I think your solution is great, but I do not see or find the changes in my system that could have caused it. But your solution solved it for now. Glad it helped. It's actually happened again to me several times (not very often tho so it's not too much of a pain) for no obvious hardware related reason. I've just done what I wrote in my Edit bit above and all is good to go again for me. I have had a full check with memtest86 and everything was OK, with only minimal hardware attached. All fine. I also discovered that I had MoBo version 2 (not 1), and I saw that I didn't have the latest BIOS (which is FH). After updating and re-attaching all external hardware, it works fine now, indicating all 24 GB is available. The RAM (Kingston) says it is meant for 1600 MHz, not 1033 or something else. So at position 12 instead of 8 I have reset it. Now it works fine. Until now no problems anymore. Do you have MoBo version 1 or 2? RAM: 6 x 4GB Kingston KHX1600C9D3/4GX. (DDR3-1600 / PC3-12800). I do not know the cause, as is in your case, but the problem has vanished for now. This has been driving me up the wall for years. I'd more or less resigned myself to my computer taking ages to boot up. Slots 5 and 6 just don't enable no matter what I try. Looking around the web, it's obvious a lot of people bougjt the GA-X58A-UD3R and have the same issue. Well I still have 24 Gb fully active and no problem at all. MoBo version 2 I have. So maybe the RAM is not good or the slots are not connecting well: interchange the memory bank or run memcheck. Try free http://www.hwinfo.com/ to see if there is something wrong. After searching and searching I came across this, and it saved my old rebuild! I run an i7 6700k now, but my old i7 930 was given back to me, and I installed 16 gb of ram (8 useable) !!! !